I saw Looper last week and found something in it I think might be a trend: a degree of optimism in science fiction. Looper and Doctor Who especially put forth an idea that what’s going to save the world is not heroes but regular people being good. Being their best. Quick, brutal summary of some elements of Looper: in the future there’s a super bad mobster guy called The Rainmaker. Old Joe (Bruce Willis) goes back in time with a list of kids who might grow up to be The Rainmaker, planning to kill them. Events progress to a point where Young Joe (Joseph Gordon-Levitt) finds out who the kid is and decides to protect him. To the film’s credit, Old Joe is in lots of ways the villain but he’s given a very credible motivation, but of course we sympathize with Young Joe since he’s a) our PoV character and b) protecting a small child’s life from a killer from the future and we can’t not root for that guy since we’ve all seen the Terminator movies. Once the story has all been laid out on the table, there’s a scene where the boy’s mother proposes that he doesn’t have to grow up into a monster. She can raise him to be good. The film ends on the hopeful note that, with the intervention of Young Joe to prevent some stuff from happening, the boy will indeed grow up to be a good kid. You have to be the best of humanity. […] We return our hostage, they return theirs. Nobody gets harmed. We can land this together. If you are the best you can be. You are decent, brilliant people. Nobody dies today. The episode “Midnight”, among others, has a similar message. Victory doesn’t depend on the hero doing something cool. It depends on everyone playing a part and being their best. Any one of them can screw it up, but if they all rise above it, it’ll come out alright. The setup there is that Luther (the blonde guy) is destined to become the story’s villain Newman Xeno (more time travel-y stuff: lots of Luthers in lots of other universes have all turned into Xeno). Casanova has saved this one and tried to keep him on the light side. He sends him off, hoping he’ll choose to be better than all the other versions of himself have (though in this case it maybe doesn’t turn out so well). 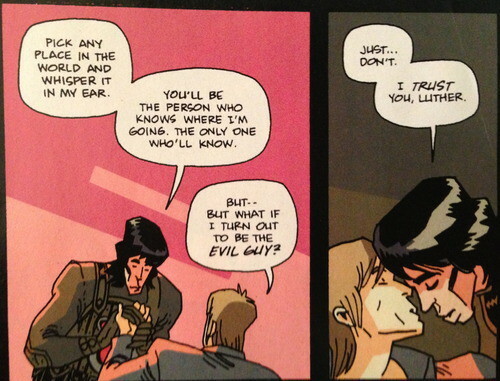 I see in that panel the same optimism as in Looper and Doctor Who. Other recent comics have tread similar ground. Uncanny X-Force has Evan, a kid Apocalypse. All-Star Superman is all about how Superman’s real power is his ability to inspire people to be their best (perhaps even Lex Luthor). 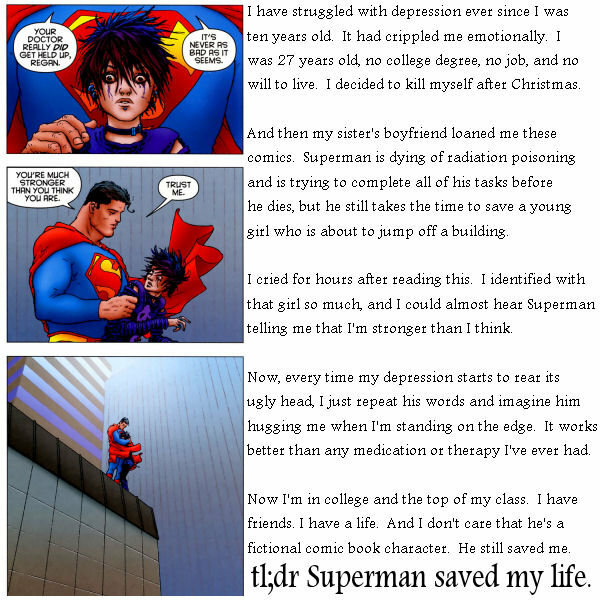 So inspiriting, in fact, that it has led people in real life away from committing suicide. What I see in all these stories from the past few years is a turn toward hope. Bruce Willis traditionally plays the gun-toting action hero. Here he’s the villain while Joseph Gordon-Levitt is the hero via self-sacrifice. Picture Luke Skywalker throwing down his lightsaber to stop the Emperor. I’ll go ahead and speculate on why we’re seeing this in sci-fi right now. September 11 reminded us how dangerous the world can be. The shooting in Aurora, CO did it again. Anyone, at any time, can open fire in a public space and kill innocent people. There’s nothing we can do about it, except to live our lives as we always do and hope that no one in the grocery store has a bomb. These stories are telling us that there’s a better way: hope. There’s a place for action movie heroics, but that’s not how the future gets redeemed. We can sit at home afraid to go out, and walk in zigzags on public streets terrified of snipers when we do, or we can hope. If I refuse to be terrorized and live my life being good, maybe others will, too. If I teach my children to try to be their best, maybe the next generation will see a little less random violence.